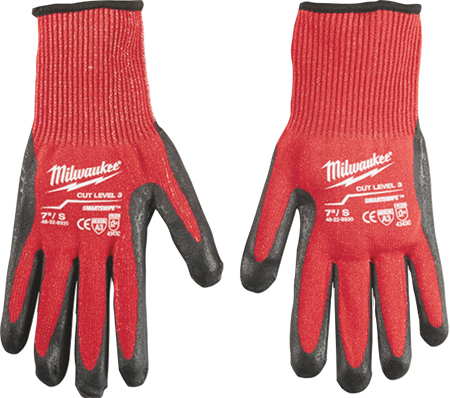 Milwaukee Tool has introduced its Dipped Gloves, ANSI/ISEA-rated for Cut Levels 1, 3 and 5, and also EN 388-rated. Designed to provide users with all-day comfort and durability, the new gloves have been developed with proprietary knitting and also feature SmartSwipe technology, enabling users to access phones or tablets without removing the gloves. The textured nitrile palm of the Cut Level 1 Dipped Gloves offers better grip on materials than previous offerings, as well as increased dexterity, and their nylon/ lycra blend construction provides increased comfort and wicks away moisture to keep hands dry. Cut Level 3 Dipped Gloves (pictured) help prevent injuries from sharp objects, and also provide a more comfortable grip and maximum dexterity when handling small objects. They feature a Comfort Web grip for improved grip performance, with nitrile dip material providing durability and best-in-class puncture resistance, according to company officials. Cut Level 5 Dipped Gloves help prevent injuries from applications such as work with sheetmetal and glass, wire stripping, and ducting. The gloves utilize a double-dipped nitrile grip for best-in-class puncture resistance and added durability.